Texas is on the verge of overhauling the way it selects grand jurors, shifting away from an antiquated process that critics say creates the potential for conflicts of interest. This story is part of our 31 Days, 31 Ways series. 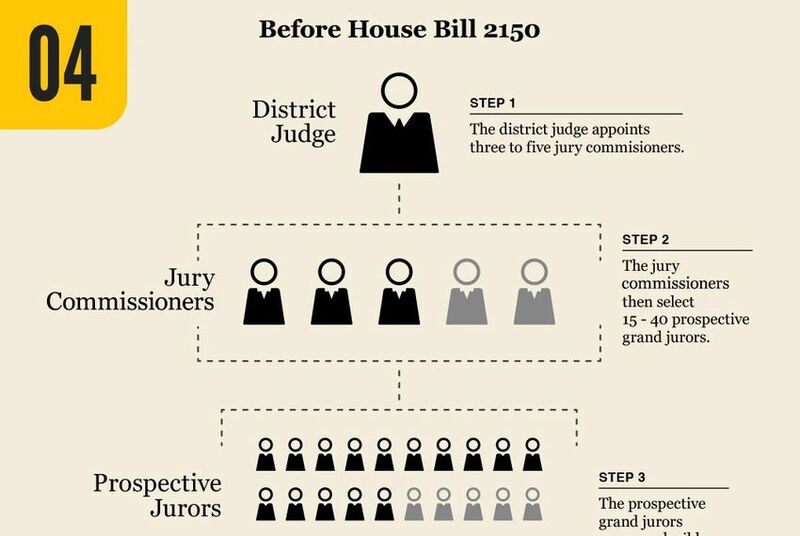 Texas is on the verge of overhauling the way it selects grand jurors, shifting away from an antiquated process that has only drawn more attention with national turmoil over policing and race. House Bill 2150, which goes into effect Sept. 1, ends the state's controversial "pick-a-pal" system in which judges appoint commissioners, sometimes friends, who then tap jurors to be summoned. Already outlawed in many other states, the process has been criticized for leading to conflicts of interest and not representing the diversity of individual communities. According to the district clerk for the state's most populous county, HB 2150 will have a major impact on the criminal justice system in Texas, but its implementation should not be too complicated. "The judge’s role in this matter changes significantly,” Harris County District Clerk Chris Daniel said in a statement. "However, this law affects the operations of the district clerk’s office very little and we are pleased to accommodate accordingly." Under the current system, a district judge has the option of picking three to five people to serve as jury commissioners, who then select 15 to 40 prospective jurors. HB 2150 removes that option, leaving judges to seat juries through random selection. "It sort of cancels out the previous system whereby the judges simply picked people that he or she knows or feels comfortable with, and I think we've seen the result of that," said Douglas Smith, a policy analyst for the Texas Criminal Justice Coalition. "Grand juries tend to be white, they tend to be older, so they tend not to represent the broader perspectives in the community." That tendency has garnered scrutiny across the country in the wake of recent shootings of unarmed black men by white police officers. In some of those cases, grand juries have chosen not to indict the police officers, raising questions about the biases held, inherent or not, by members of the panels. Grand jury reform was once again in the spotlight in Texas about a month after the most recent legislative session ended. That's when a shootout between bikers and police rocked Waco, setting up a grand jury probe of the incident. Even though HB 2150 does not go into effect until Sept. 1, McLennan County chose not to use the "pick-a-pal" system to select jurors in connection with the shootout, according to the Houston Chronicle. The judge in the case nonetheless wound up picking a veteran cop to serve as the jury's foreman. State Sen. John Whitmire, the Houston Democrat who sponsored HB 2150, noted that it provides checks against such selections. "Actually, the law was passed to stop exactly what Waco did two weeks ago," Whitmire said at the end of July. "I don't think we've heard the last of that." The first major test of the bill could come soon after it is implemented, with a Waller County grand jury expected to probe the death of a young black woman in police custody there. The woman, Sandra Bland, was found hanged in a Waller County jail cell after a confrontation with a white police officer during a traffic stop. An autopsy has indicated Bland committed suicide. "You can't have a criminal justice system if people don't have confidence in it," Whitmire said. "We'll all be watching."